iconic coastal exposure to the elements. 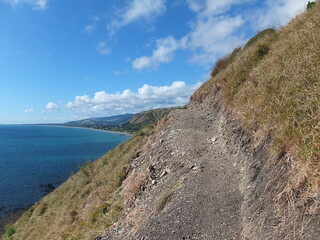 Another of the things I found myself doing during the recent visit, besides this Easter tramping trip, was to check out the new Paekakariki Escarpment Track, one of the contributing sections of the Te Araroa Trail. When completed, this route will provide a dedicated walking corridor between Paekakariki and Pukerua Bay, alongside the coast north of Wellington. It’ll make the most of both iconic coastal scenery and iconic coastal exposure to the elements, and it’s completely accessible at both ends by Wellington’s metropolitan commuter train network. I’d not even considered visiting this track until I noticed in the DomPost that the access was about to be partially opened, although its pending construction has been in the news since at least mid-2011. My only available day was Saturday 23rd March, so I bought myself a Day Rover ticket, hopped on a train to Paekakariki, and went off to hunt for it. As an aside, the Kapiti and Johnsonville metro lines in Wellington are both very interesting tourist lines when you’re not a daily commuter. As is typical for me when I do things on a whim, I messed this up. It was a few days before the Te Araroa Trust had posted this on their website, which would have been useful information to have had in advance. In my haste I’d assumed I knew where I was going without making the effort to check. I mean, I’ve been to Paekakariki heaps of times, and I imagined that the obvious starting point for such a track would be near the intersection of SH1 and the Old Paekakariki Road. There was nothing obvious there, however, and I spent an hour walking around Paekakariki searching for a vantage point on the hill across the road, thinking it must somehow begin from further north. Failing to find it, I then spent 40 minutes walking up the Paekakariki Hill Road before I finally decided I was going the wrong way. Not the nicest road to try and walk on. 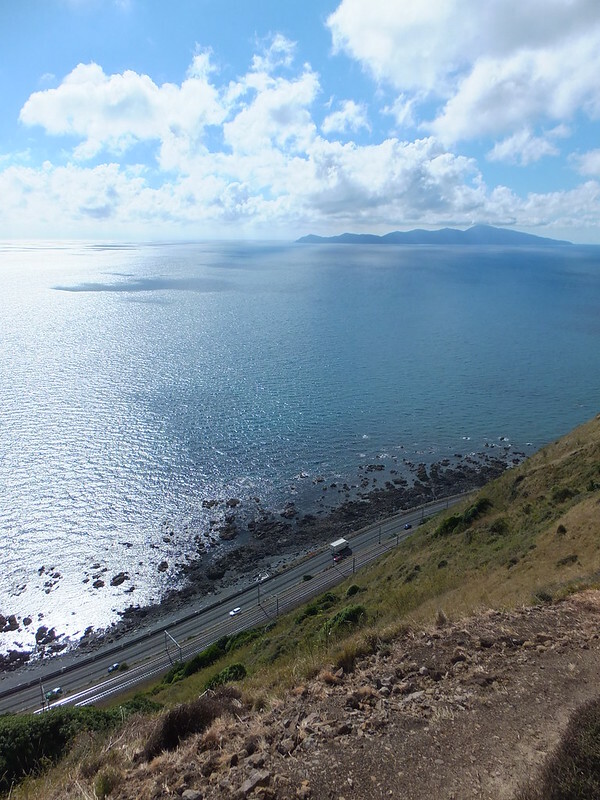 For those who have never tried to walk along the Paekakariki Hill Road, it’s a horrible road to follow on foot. One side of the road is crunched up against a very steep hillside. The other side of the road often has little space between the edge of the road and a steep drop. To top it off, the road is frequented by middle-aged people who like to test their expensive boy-racer lookalike cars. Some years ago, I walked the entire length of this road to Pauatahanui, and was perpetually paranoid that a driver would come screaming too tightly around a blind corner. I don’t know how cyclists manage to remain sane on these types of roads. 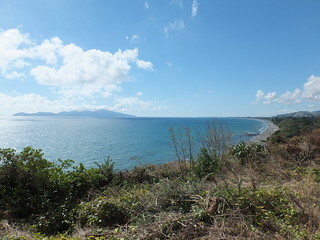 It has some good sights of the coast-line and Kapiti Island, though. probably would have saved a lot of time. By now, I’d wasted a substantial amount of time walking around Paekakariki, 40 minutes walking up the entry part of the road, and probably another half hour walking down. As I walked down, I looked at the SH1 bridge over the railway line below me, and noticed what appeared to be a walking track. Duh. 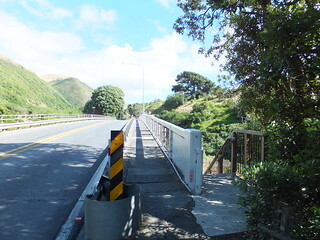 My disorganised start to the day had meant that it was now about 2.45pm in the afternoon, and I finally stood at the end of that SH1 bridge south of Paekakariki, which has steps down to an underpass, and the beginning of a very nicely and recently graded walking track. 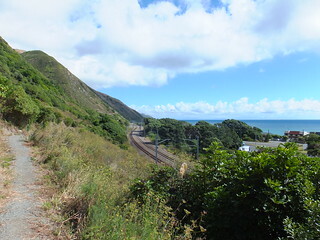 As an aside, I notice that the current Te Araroa instructions for reaching this end of the track indicates “the 700m walk alongside SH1 [from Paekakariki Railway Station] is not recommended“. I don’t fully understand the reasoning of this recommendation, because that stretch of road, while being a highway, isn’t especially dangerous for walking. It has a perfectly good footpath, which I used and which can be seen on Google Streetview. Typical for the Paekakariki end of the track. The complete walking track wasn’t open by this point, of course. From the northern direction, where I was, it begins as a very casual, flat and easy walk above the railway line, but far enough from vehicles that they don’t dominate the experience. 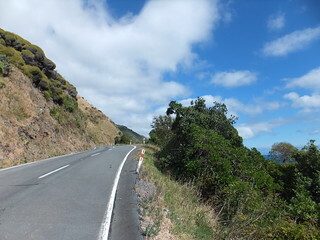 Along here it doesn’t climb very high, but doing so is not necessary for clear scenery in a northerly direction off the coast towards Kapiti Island, and Paraparaumu Beach. It occurred that easy-graded mountain bikers would probably love the track, but they shouldn’t ride here because it’s only legal as a walking track right now. Furthermore, that flat, gentle gradient doesn’t last. After a point, the track very suddenly and steeply starts switching back and forth up the hill-side. At the place where I checked (the highest point I reached), it had only climbed 160 metres above sea level, but the steep-ness of the hillside, the suddenness of the ascent, the distinct lack of vegetation to act as catching features in case of a fall, and the lack of many other landscapes for comparison off the coast, gives it a feeling of being quite high and exposed. If I could choose which locations on which I’d prefer to trip and fall, this would not make the top ten. It was still not fully complete, however, and maybe its final state will be more accommodating. Quite narrow on a steep bank. At about 3.40pm, I decided that my wasted time earlier in the day meant I’d really need to turn around. With few people in the vicinity and little reliable information about how complete things were towards Pukerua Bay, I didn’t want to risk being caught on this track after dark, especially as I didn’t have enough info about the completeness of the route to Pukerua Bay at the time, and I had something of an obligation to be back in Wellington for dinner. The visit was good for a short nosey to see what was happening in the area, anyway. The Paekakariki Escarpment Track had especially caught my attention because the last couple of times I’d wanted to walk between those two places, it was a requirement to walk alongside State Highway 1, complete with noisy traffic and ugly vehicle barriers. That was hard to take, because it’s an awesome coast-line, yet it’s also always been frustrating to me that this is one of those spaces where it’s simply not been possible to walk between two obviously nearby places without having the experience completely dominated by noisy and dirty traffic. That walk along State Highway 1 has never been as much as it could have been without the invasion of motorised traffic, given everything else in that region. To be fair, it’s not as bad as some other situations, if only because there’s at least a shared cycleway and footpath along that road. Walking above the Main Trunk Line. I’d always thought that the land above the road and railway line was private farm-land and never been completely sure of the access rights, but having seen this track I looked it up on the Walking Access Mapping System. It turns out that the land in question is actually zoned as land for Railway use by the Wellington Regional Council. Apparently the Nga Ururoa volunteer conservation group has been looking after the area for some time. Perhaps this made it easier to build a walking track, although the lengthier story describes complications with surrounding land access issues. In October I wrote on how I think the precedent of continuity is one of the greatest things about the Te Araroa project, definitely much moreso than the ability to walk 3054 kilometres from Cape Reinga to The Bluff. Obviously being able to walk a really long way, over several months, appeals to a handful of people, but much more important is that lots of people, and notably local residents of local areas, can have the ability to (using some Wellington-region examples) walk from Paekakariki to Waikanae, or from Porirua to Wadestown, or from Pukerua Bay to the Fisherman’s Table Restaurant. Te Araroa creates a back-bone of priority walking access between useful places, including places where the possibility of walking has been eroded in the face of vehicles and other infrastructure over the past century. This track is a prime example of the positive influence of the Te Araroa project, the Te Araroa Trust, and the related regional trusts such as the Te Araroa Wellington Trust. The access might always have been opened through an alternative combination of events and efforts, but even after many decades, that hadn’t actually happened. Te Araroa created the excuse and the motivation, and provided an incentive to attract funding and a structure for applying that funding between the Kapiti Coast District Council and the Porirua City Council. Now it will be possible for people to walk comfortably north and south out of and into Wellington, without having to take second priority to motorists. In the long term, I hope it’s only a starting backbone for what could be many such priority walking connections between different parts of the country. This entry was posted in daywalk and tagged daywalk, te araroa, walking, wellington. Bookmark the permalink. Oh, so THATS where it starts. I’ve noticed the track along the other side of the railway lines the last few times we’ve been through there, but had no idea where it might start. I would have assumed it started on the other side of SH1, though I have no idea how one would get to it if that were the case. Yes I was kicking myself when I finally found it. I probably should have spent a little more effort researching things before I left, but sometimes it’s just fun to wander around looking for what’s new. Just walked the length of this track this weekend. Suffering from back issues I have been banned from tramping for a while, but managed to convince the missus a nice walk along a graded platformed track would do me some good. The south end of the track doesn’t quite join up yet – it ends abruptly at the rail line 200m north of Toenga Rd. A gravel road runs opposite beside the line to Toenga – but being on a curve this looks an unlikely spot for a permanent pedestrian railway crossing. A roughly trodden track, and painted tops of the fenceposts, indicates the track continuing on the east of the rail-line, along the fenceleine to where it will eventually terminate at the former Muri Station (where there’s a level crossing). Heading north, the track is clear, benched with stairs where required – but not yet graveled. It runs about 1km north crossing a first small wooden bridge in the 1st gully, , then a longer suspension bridge in the next gully, beyond which it ends abruptly. From here a series of marker posts mark the eventual onward route. This sidles a face for another 500m or so, to reach a ridge dropping NW. Following this down you reach another magnificent suspension bridge, connected at either end to nothing more than grassy slopes. Marker poles climb steeply keeping just downhill of the fenceline until thick scrub is reached. A well trodden route sidles below this bush, dropping steadily until, just as things start to look steep, it disappears into the now-tall-scrub at a point marked by a metal cross on a tree. Inside the bush is magnificent. 4-6m tall varied trees, the dark floor beneath the full canopy is almost free of vegetation. A mass of pink flagging tape confuses the way, but by continuing to head north following tape, you cross a few small clearings and eventually pick up hose-pipe and black alkathene which marks the next section. Quite why a km-or-so of pi[ping is used here to mark a track I have no idea. Exiting the bush, following the lengths of alkathene, the trap-line (for that’s what it has been up to this point) encounters an old 4wd track, starting in the middle of nowhere. A lovely carved wooden bench indicates that this was once a cared-for walk. The 4wd track ends a few hundred meters later (again in the middle of nowhere) but an old benched walking track continues from this point. Zigzagging down, crossing a stream, then continuing to sidle the steep faces beyond – still marked by alkathene pipe. This benched track is old and overgrown / slipped in places, but is generally good going. Eventually, the benched track ends where two posts and a wooden rail have been placed across it’s route – a bluff beyond looking crumbling and uninviting. 100m back, before the posts and rail, a good ridge with a fenceline up it’s centre, offered an alternative route. After a 20m scramble up from the benched track to the fence, you pick up another well traveled, well-cut, route through the scrub and grass, climbing on the northern / downhill side of the fence. This eventually reaches the summit of the ridge where a gate across the track marks the summit. Beyond is a bench and the start of the completed northern end of the new walking track to Paekakariki described by Mike above. This entire route runs on the coastal-side of the fence, and is such appears to avoid farmland and remain on crown land, and as such probably legally permissible at this stage. 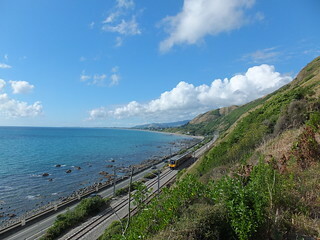 The ‘dodgy’ bit being the connection at the Pukerua Bay end where you’d have to push along the roughly cut/trodden route along the fenceline to avoid a probably-illegal crossing of the rail line. Oh – and all the structures (bridges) are officially still closed. The bush sections were dark, cool and beautiful. The views from the open ridges spectacular across to the South Island , Kapiti, and up the coast Not a real tramp, but certainly enjoyable. Once it’s complete it’ll make for a great day walk with a train-station at each end. Thanks, Matt. I think I’ll aim to have another look at this within the next few weeks, hopefully with more organisation than my previous effort. Yes – be warned it’s a tramp not a walk until the track is complete. Steepish sidles particularly. Hi John. I can’t say from first-hand experience because I didn’t look, but on a perfect day I can’t think why it wouldn’t be visible. 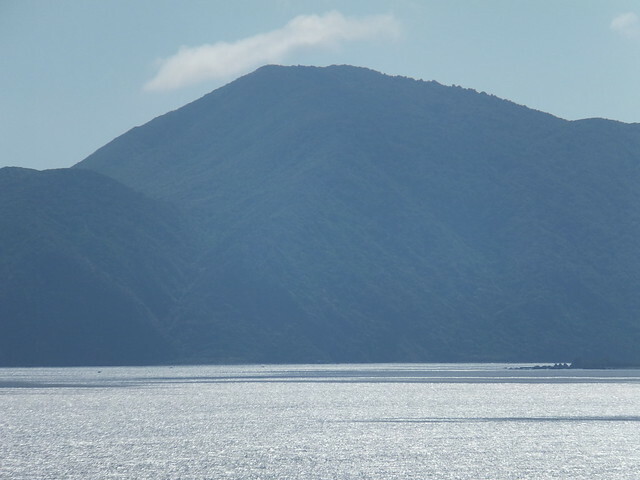 There’s a direct line of sight (I don’t think Kapiti Island is in the way), and the mountain is visible from further away and similar elevations in other locations. Well … as with Mike I can’t say I’ve seen Taranaki from the summit of the track. But you can see it from the train most of the way along that section, though it disappears behind Kapiti Island by the time you reach Paekakariki. So it would definitely be visible on _some_ parts of the track, once the full length opens. Apparently work is now restarting on the escarpment track, with secured funding. It’s nearing completion for an official opening in April. That’s great to hear.